A file photo of a MiG-27 fighter, one of which crashed 18 minutes after take-off from the forward base of Uttarlai in Rajasthan on March 31. The sudden spike in crashes during routine training is a setback to the IAF's efforts to improve its safety record. 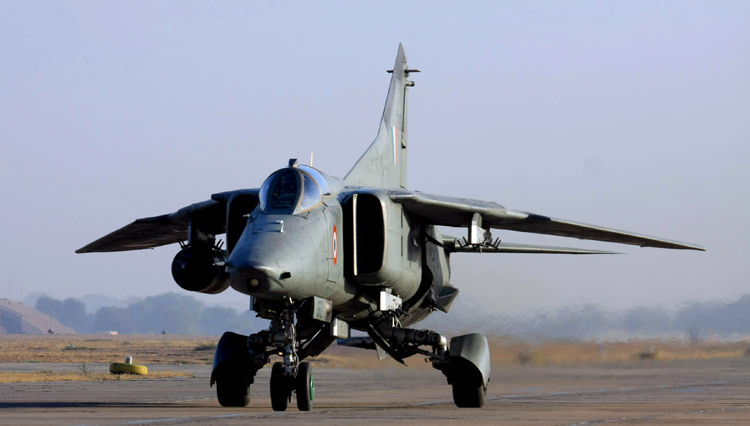 The dismal flight safety run of the Indian Air Force (IAF) in the ongoing calendar year continued, with the crash of an upgraded MiG-27 fighter-bomber in Rajasthan on March 31. The pilot ejected safely and there were no reports of damage on the ground. "An Indian Air Force MiG-27 (Upgrade) aircraft got airborne from Air Force Station Uttarlai, Rajasthan at 1127 hrs today for a routine sortie. The aircraft crashed at 1145 hrs, approximately 120 km south of Jodhpur," an IAF spokesperson announced in a statement. This is the fifth fighter crash suffered by the IAF in the first three months of 2019, besides the loss of sixth - a MiG-21 Bison flown by Wing Commander Abhinandan Varthaman - in an aerial skirmish with Pakistani jets above the Naushera sector of the Line of Control on February 27. Three of the five peace-time fighter crashes so far this year have taken place in Rajasthan. These five crashes have taken place in a span of just 62 days, and imposed a major unexpected challenge on the IAF leadership. The trend this year is a reversal of the dramatic improvement in the IAF's flight safety record over the last decade. In addition, one Mi-17 helicopter suffered a catastrophic crash after take-off from the Srinagar airbase on February 27, at a time when the Indian and Pakistani fighter jets were locked in an aerial confrontation above the LoC. Media reports have suggested that the helicopter crash could have been the result of an accidental fratricidal kill by the IAF air defence which was on the highest operational alert following the ingress into Indian airspace by Pakistani fighters which triggered a confrontation over the LoC with scrambling Indian fighters. All six personnel - including the two pilots, Squadron Leaders Siddharth Vashisht and Ninad Mandavgane - on board the helicopter died in the crash. Besides, two Hawk aircraft of the Surya Kiran Aerobatics Team crashed in Bengaluru on February 19 after a disastrous mid-air contact during rehearsal of aerobatic manoeuvres ahead of the showpiece Aero India air show. Wing Commander Sahil Gandhi, who was piloting one of these aircraft, perished in the crash. The peace-time losses rankle in the face of a severely depleted fighter fleet. Against a sanctioned strength of 42 fighter squadrons, the IAF numbers are down to 31, and continue to be in free fall, with the vintage Soviet-origin MiG-21 and MiG-27 fleets scheduled for decommissioning. The IAF's crash fatality toll this year stands at 9, including five pilots. On February 1, two test pilots - Squadron Leaders Samir Abrol and Siddharth Negi - were killed in the crash of an upgraded Mirage 2000 fighter during an acceptance sortie take-off in Bengaluru. This mishap stunned the aviation community because the Mirage-2000 type has the best safety record in the IAF fleet. The other fighter aircraft lost by the IAF in the continuing spate of crashes since January 28, 2019 include 1 MiG-21 Bison, 1 Jaguar and 2 MiG-27s. Three of the five peace-time fighter crashes so far this year have taken place in Rajasthan. These five crashes have taken place in a span of just 62 days, and imposed a major unexpected challenge on the IAF leadership. The trend this year is a reversal of the dramatic improvement in the IAF's flight safety record over the last decade.